The Olde Judge Mansion’s rooms bear the names of hostess Tina’s family. 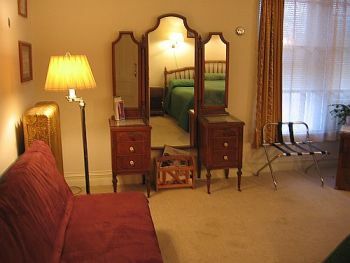 All rooms have a TV, VCR, Air Conditioning & WiFi internet access. The Dunphy and Oatman rooms share a common bathroom. Designated off street parking is provided. If you’re traveling on business, ask about our extended stay options. We offer comfort and flexibility — come and go as business dictates. Prices quoted do not include taxes. Please ask about our monthly rates. We also offer a $5 discount per room per night for a personal Check or cash.